The Kenwood KMC570 Chef Premier is stunning and robust! As always Kenwood have thought of everything. The body of the mixer is made of metal and is fairly heavy as it houses a massive 1000w motor that will work efficiently for years to come. The machine comes with 4 mixer/beater attachments including a dough hook for making bread, K-beater, whisk and flexi-beater. It also comes complete with a thermal glass blender which you can blend mixtures together such as for soup and smoothies, which simply attaches to the top of the machine. There is also a CD ROM with recipes, a recipe book with cakes, pastries, icing, biscuits, mashed potato, bread, soups and sauce recipes etc. A handy DVD is also supplied which shows the basic functions of the mixer and the myriad number of attachments you can buy that connect to the mixer either at the front, as part of the bowl/mixer functions or the area at the top where the blender goes. The extra attachments available include pasta makers, grinders, liquidizers, food cutters, grain mills, potato peeler, an ice cream maker, citrus press & a juicer. Included with this mixer is an attachment spanner for tightening the 4 mixing tools and a spatula for scraping out the bowl. All in all the Kenwood KMC570 Chef Premier makes light work of most kitchen tasks and is a must for budding cooks & chefs. As you may be able to tell we love Andrew James products here at Foodshack and the Electric Food Stand Mixer is no exception. 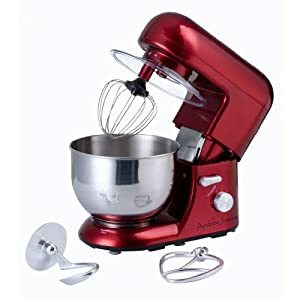 The stand mixer comes with a powerful 1000 watt motor with 6 power levels & pulse level as well as a large 5.2 litre bowl with splash guard and 4 attachments. The attachments included are a Dough hook, Flexi Beater blade, Aluminium Beater Blade and a Stainless Steel Whisk. 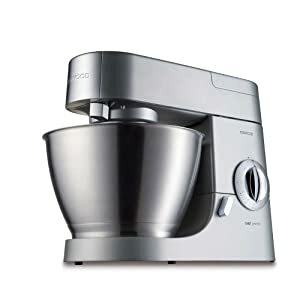 The mixer is easy to setup, clean and use and comes with a handy Food Mixer Cookbook which includes recopies for bread & cakes. The mixer also has suction pads on the feet to make sure it does not move around on your work surface. Unlike the Kenwood or Kitchenaid stand mixers this is a no frills machine. It comes with all of the attachments available on the market and you cannot add juicers, mincers, blenders or the plethora of accessories that are available. It's simple, basic but more than adequate for all mixing jobs. The Andrew James Mixer is a kitchen lives up to its name and reputation. Solid construction will mean it can stand up to the punishment an active kitchen and cook can give it. Its unique design is one that will find its way to a shelf rather than stored away in the cabinet. The mixer comes in 3 colours: Red, Black & Silver. As Tefal enters the stand mixer arena with the Tefal Kitchen Machine, we wonder if the boasts of power, elegance and efficiency at a reasonable cost are accurate. We are also intrigued to see if it can perform or even outperform the Kenwood or KitchenAid stand mixers. On first impressions the stand mixer looks smart but the main body of the machine is made from plastic and the tools are made from aluminium , which makes you wonder if this machine is made to last but keeps the machine light and easy to manoeuvre around your worktop. It also has suction feet to stop it from moving when in use. The plug can be stored in the base of the machine however some of the accessories can be quite tricky to store away. The kitchen machine is easy to use, and fitting the attachments is a doodle when using the markings on the machine as a guide. Most of the attachments are dishwasher safe, which is great with the harder to clean fiddly attachments. 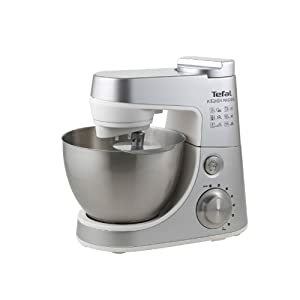 There are 6 speed positions and a pulse setting helping you to combine that delicate cake mixture with control to guarantee the perfect consistency. The Tefal Kitchen Machine can handle everyday baking and food preparation tasks well and if money is tight a great purchase. However if you are looking for a machine with a lot of power a lot of reviews are suggesting that this machine will struggle. This is disappointing as at the moment the machine only comes with one motor option which is not the case with other stand mixers on the market.